When Sergeant Hallie Michaels comes back to South Dakota from Afghanistan on ten days' compassionate leave, her sister Dell's ghost is waiting at the airport to greet her. The sheriff says that Dell's death was suicide, but Hallie doesn't believe it. Something happened or Dell's ghost wouldn't still be hanging around. Friends and family, mourning Dell's loss, think Hallie's letting her grief interfere with her judgment. The one person who seems willing to listen is the deputy sheriff, Boyd Davies, who shows up everywhere and helps when he doesn't have to. As Hallie asks more questions, she attracts new ghosts, women who disappeared without a trace. Soon, someone's trying to beat her up, burn down her father's ranch, and stop her investigation. Hallie's going to need Boyd, her friends, and all the ghosts she can find to defeat an enemy who has an unimaginable ancient power at his command. 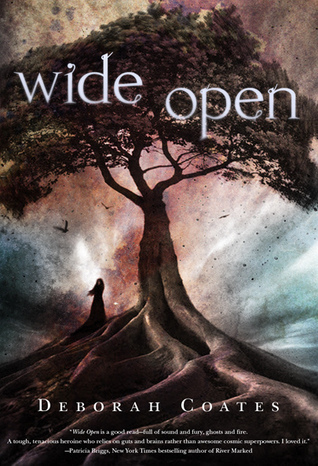 I rarely read adult novels, but I read the description of Wide Open and was intrigued by the premise of the story, so I picked it up. Drawn into the novel from page one, I couldn't complete relate to the main character, but there was something about her that tickled my fancy. Irrational, full of rage and gets pissed off pretty quickly by the man who keeps showing up to save her. Because, quite frankly, she really doesn't need to be saved. Not only that but dear Hallie can see ghosts and when she comes back after finding her sister has passed, guess whose ghost starts following her around? That's right, her sister Dell has some unfinished business it seems and Hallie is determined to find out what caused her sister's death before her leave is up. I enjoyed the build-up of this story. Giving you a little bit here and there until the big reveal at the end. It wasn't completely predictable but still a bit surprising and the whole book really built it up to a level where you just needed to know now. Final Verdict: Full of suspense and action, Wide Open was a stunning read that impressed me and I especially applaud it for building up such a strong female heroine. I’m not entering the contest, but I’ve read a lot of great reviews for this one. It’s an original concept – and I’d love to read the point of view of a woman who’s been in the military and to war. For a YA novel that focuses on a hero who’s come back from the war, Trish Doller’s Something Like Normal looks awesome. I’m definitely enjoying this one. I too read adult novels sparingly, but this one has crossover appeal and is well-written and atmospheric to boot. Great stuff! This sound like a great book. Beautiful cover and sound very good….would love a chance to read this. Thank you for the giveaway. The book sounds like it could be a great read. Sounds good. Thanks for the chance!! I really like what I’ve heard about this book so far. Kind of a mystery/paranormal, and the cover is gorgeous. I’d love to be entered. Thanks.